Tricky start with little wind and strong tide under us so most of the fleet were motoring furiously away from the line up to the 5 minute gun and then drifted down to the start. No one over the line but with little steerage we managed to collide with KMS buoy so now have a nice yellow strip down the side of the boat. Reasonable spinnaker leg down the Solent but seemed to be loosing out to Blazer and Alchemist had a new turn of speed which we found out later was due to fresh antifouling. Coming up to Bembridge the leading boats were into the adverse tide and looked like they were waiting for us and we managed to get ahead of Xara as she struggled to get round. Keeping out of the tide and ended up right in Sandown Bay and as we came out decided to changed down to the number 3 just as we hit the overfalls on the corner. After that it was pretty lumpy with a particularly large greeny swamping the boat in the overfalls at St Catherine's. Unfortunately not much relief as we rounded St Cats and carried on pretty similar to the finish. 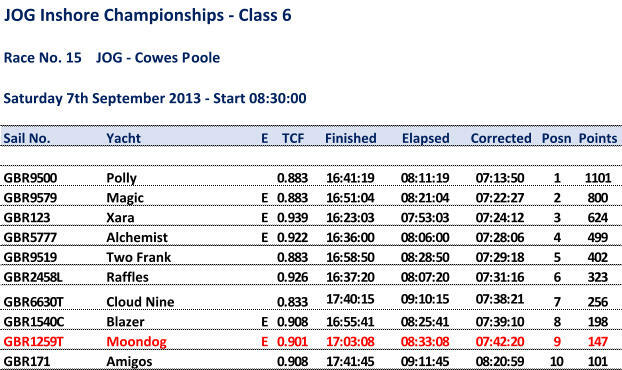 Result about as good as expected in the conditions which would always favour the heavy fully crewed boats.